How Do I Move the Taskbar Back to the Bottom? - Ask Leo! Occasionally, the Windows taskbar can end up on either side (or even the top of) your screen. 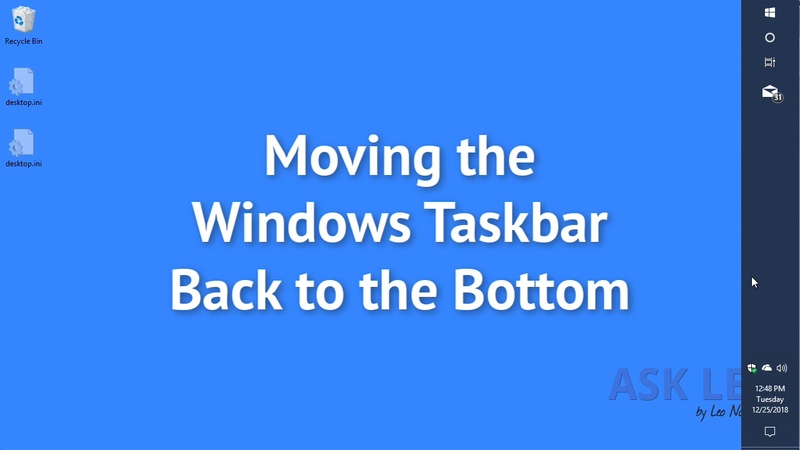 I'll show you how to move the taskbar bar back to the bottom. My taskbar’s on the right side of my screen. How do I move the taskbar back to the bottom where it belongs? A lot of people don’t realize it, but the taskbar can be placed on any edge of your screen: left, right, top or bottom. In fact, if you have multiple monitors, it can be placed on any edge of any display. So, let’s move the taskbar back. Right-click in an unused area of the taskbar. Make sure that “Lock the taskbar” is unchecked. Left-click and hold in that unused area of the taskbar. Drag the taskbar to the side of your screen on which you want it. 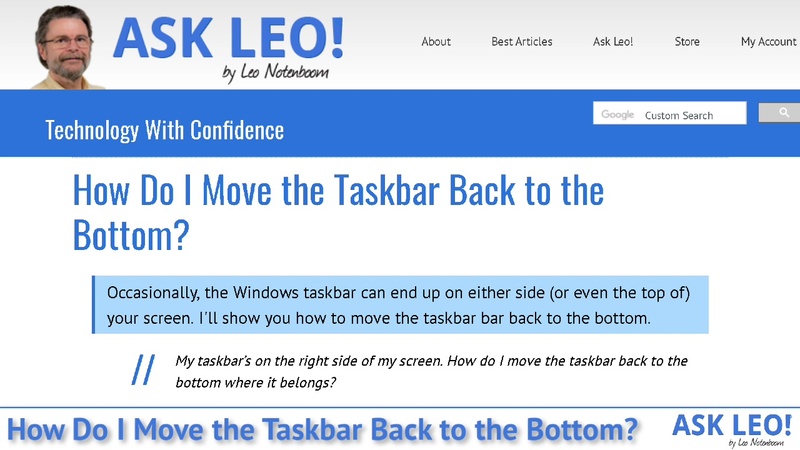 Now right-click, and this time, ensure that “Lock the taskbar” is checked. Why does the taskbar move on its own? The most common cause for the taskbar to show up on an odd edge of the screen is that it was unlocked (which allows for this kind of movement), and somehow this click-and-drag approach mistakenly happened. For example, perhaps you thought you were moving something in another application, but “overshot” with the mouse click and ended up dragging and dropping the taskbar instead. Of course, other types of mouse movement, and even the occasional bug, could result in the taskbar moving to somewhere unexpected. One of the reasons we “lock” the taskbar after moving it back into place is to prevent this type of accidental movement in the future. Why Does the Mouse Pointer Jump around the Screen? - Fortunately for most cases, there is a simple solution to why your mouse pointer would jump around the screen. « Previous post: What Is “About:blank” and How Do I Get Rid of It? The taskbar is usually kept at the bottom of the screen, but there are some results that show that for most people it’s better to have it at the top. Certainly that is where I have mine and I certainly find it easier to have it there. What you said brings up an interesting point. There are many ways to improve the usability of an interface. Companies like Microsoft spend a lot of time and money in researching these, but when they implement the change, what people really want is what they’re used to. i mean when i click the space area on the task bar, nothings happen. no properties shows! Are you sure you’re right clicking and not left clicking? Man I thank you! It has been forever since I did something like that and my mind went blank thinking oh great now I waste a lot of time figuring it out when I read your excellent reminder and WahLah!!! THANK YOU!! My taskbar has moved (apparently of its own accord) to the vertical and all the clicking and dragging as per instructions on this site doesn’t work to get it back horizontal. I have made sure it is unlocked so why won’t it move / how can I move it? Thank you so much! i hate having the taskbar on any other side. i need it to be on the bottom, im just used to it. this really helped. I want to move my taskbar to the left of the screen. It is unlocked, but when I drag and drop it the screen flashes black, then resets the desktop with the taskbar back at the bottom and desktop icons moved into top left of the screen. The same thing occurs when I go to properties and switch the drop down menu to ‘left’. Please, someone help me, I’ve had my taskbar to the left for years, the fact that it is stuck on the bottom is driving me crazy. Thanks Leo. I have been right clicking, but not dragging. Now my task bar is where I want it. Such a simple task. I locked it this time. Thanks so much for your help. At first I didn’t read your instructions carefully & I clicked on my left instead of my right or visa versa??? Once I read it again & REALLY followed your directions, it worked perfectly & I moved the taskbar back to the bottom. Now I have locked it & hopefully I won’t have to go through this again! I need to be more careful when I read the instructions & make sure I actually follow them. Unfortunately, my 72 year old brain doesn’t work as good as it used to so I know I will be referring to your site often. Thanks again. Thank you so much. Think my mouse is going. It doesn’t want to copy or move things when I want it to, but likes to do stuff I don’t want it to like moving my task bar from one place to another. You are very kind to share this info. THANK YOU FOR THE EASY INSTRUCTIONS! I may have a MS in healthcare, but I did not know how to move the taskbar from when my kiddos changed it, and this was the easiest and quickest way/instructions. Thanks again!!! Thank You very much! This is helpful if sometime it happens. I usually forget this and try to drag but doesn’t work but when i read this it always works. Fixed in like 5 secs. You probably need to unlock it first. This article explains how to do that. THE CLOCK AND DATE IS TOO FAR ON THE RIGHT TO READ. HOW TO MOVE IT BACK TO THE LEFT SOME. I was at my wits’ end trying to get back my vertical taskbar to it’s original position. So glad I happen to find your website which solved my problem. Thank you !! I’m your latest fan. Thank you for the information about how to move the task bar back to it’s right place. Video was easy to understand and follow. Brilliant. Look forward to receiving your newsletter. Thank you for your help, didn’t know how to move my taskbar, you make it plan and simple. Ah…..I’ve been trying for quite a while to just use my intuition and just drag this stupid toolbar back to the bottom of the screen where it belongs. When the wind knocked over my laptop, it seems to have taken 15 screenshots of the ground plus moved my toolbar to the top….so very rude. Thank you. Turns out where you said left click in the unused areas first to do…..I still kept rick clicking and cussing until I re-read it…ah damnit, he said left click. I’d love to post another new question on why the Holy **** can’t it be just a tad easier……oh well, I’m out, Planet Claire here, over & out and a thanks. My toolbar has slipped down so only half of it is showing. How do I get it up so I can see the full bar? Which toolbar are you referring to? Thank you very much. I’ve locked my toolbar in place now. HOW DO I UNLOCK THE TASK BAR? 2. Right-click in an unused area of the taskbar. 3. Make sure that “Lock the taskbar” is unchecked. Step 2 means if there is a checkmark after “Lock the taskbar” click on it to remove the checkmark. If it stretches you’re not clicking on an empty area IN the taskbar — you’re clicking on its border.